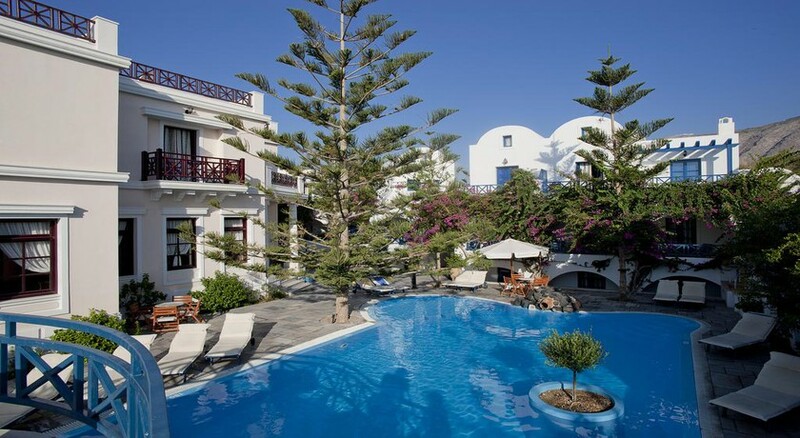 Located right on the famous beach of Perissa, Veggera Hotel is an all-inclusive family friendly 4-star hotel on in the picturesque island of Santorini. Away from the touristy areas, the hotel is located in a quiet environment overlooking breathtaking views over the Aegean Sea. The architecture of the hotel reflects local Cycladic influences. The hotel warmly welcomes guests to relax with facilities like 3 swimming pools, a hot tub, a restaurant and a gym. 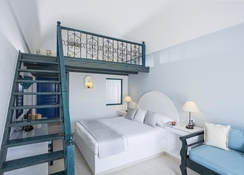 Immaculate guestrooms and maisonettes with contemporary décor, offer amenities like a satellite TV, private balcony, modern furniture and a host of other guest amenities which is sure to make you feel at home during your holidays in Santorini. 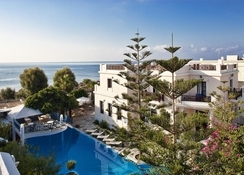 The hotel is located right on the famous beach of Perissa, Santorini. This is a fabulous black sand beach stretching for 7km kissed by crystal clear waters. The Santorini Water Park is at 500m, while Ancient Thera is 12km away. The distance to Santorini International Airport is 13km. Veggera Hotel offers a total of 57 rooms for its guests. Offering accommodation choices that come in types such as single rooms, double rooms, maisonettes and suites, all rooms showcase lush interiors and bright decor. The rooms come with King or Twin beds, a satellite TV, a seating area, a work desk and en-suite private bathrooms. Guests can enjoy excellent sea or pool views from the balcony. Veggera Hotel serves a sumptuous breakfast to the guests in the lounge area. The Pergola restaurant is where guests can dine with breathtaking views over the Aegean Sea. Expert chefs dish out authentic signature dishes prepared from the freshest of ingredients. Guests at the Veggera Hotel can spend the morning in the lounge area. The hotel offers two adult swimming pools, one children’s pool and a terrace besides having access to a private beach. There is a fully equipped gym for those who wish to stay active. Rejuvenate yourself at the spa with a steam room offering massages and therapies. Tiny tots can have fun at Kid’s Playground. Guests can also shop at the mini-market on-site. My sister and I spent a week here at the start of the season. Hotel staff were very friendly and helpful, room was spotless and overall facilities were very good. Only down side was being half board you ate of a more limited menu which clearly was not of the same quality as the main menu. We really enjoyed our stay Veggara hotel, delicious breakfast every morning very friendly and attentive staff. Less than a stones from a beautiful black sand beach with plenty of facilities. Dinner in the was again delicious with a wide range of options. Then spent the night drinking cocktails and Greek brandy in the poolside bar. Highly recommend this hotel for a relaxing getaway.